We can now get a proper look at the TAL-BassLine-101 interface. 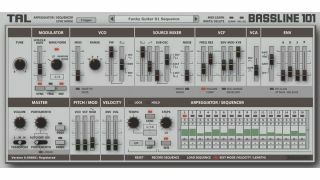 Togu Audio Line has released the TAL-BassLine-101, an emulation of Roland's classic SH-101 synth that it previewed last month. The company is no stranger to the Roland back catalogue, having previously turned to its Juno-60 synth for inspiration when creating the TAL-U-NO-LX. Togu Audio Line says that TAL-BassLine-101is one of its most accurate emulations. It offers the same features as the original hardware, plus a few new ones to bring it up to date. Check out the spec list below. TAL-BassLine-101 will initially retail for $40, with the price rising to $60 in a couple of months.